The first Icelandic inhabitants were not Vikings or Scandinavians, but early Irish or Scottish people, newly published archaeological work reveals. The Icelandic people have long had an interest in the early settlers who founded their nation, one of youngest islands to be inhabited worldwide, and have held that their forbearers, the island’s first inhabitants, were Vikings. New archaeological discoveries related to artificial caves at Seljaland in southern Iceland now reveal, however, that human activity predates early Viking settlements by almost a century. These man-made caves at Seljaland are dramatic sites, with a large number of crosses surviving today to mark the cave walls. 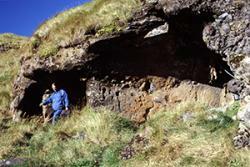 Three-chambered artificial cave of Seljalandshellar. Photograph looking northwest. : taken by © Kristján AhronsonAlthough not a new find in themselves, Iceland’s artificial caves received little academic attention for decades though they have been attracting increasing attention in recent years, with Seljaland’s caves being now studied as part of a systematic archaeological invesetigations into early Iceland. Now, writing in his latest book, Into the Ocean: Vikings, Irish, and Environmental Change in Iceland and the North (University of Toronto Press; ), archaeologist Dr Kristján Ahronson of Bangor University challenges the accepted history, revealing that the cross markings inside the Seljaland caves (and elsewhere in southern Iceland) bear striking stylistic similarities to those found in the northern and western fringes of Britain and Ireland. Dr Kristján Ahronson explains: “The history of early Celtic ‘saints’ and their role in spreading Christianity along the western seaboard as they sought seclusion is well- established. What my work has done is to demonstrate that they could have travelled far further, as far as Iceland, in their quest for the wild places in which to follow their religious life. Certainly, the presence of such communities in Iceland – before the well-established arrival of Viking-Age Scandinavians – would explain our discoveries at Seljaland. Adding weight to the analysis of his hypotheses, Ahronson details further discoveries. He has also been able to accurately date one of these man-made caves by finding construction waste from the digging out of that cave from the Icelandic rock. He has been able to date this construction waste by relating it to layers of volcanic ash debris – these ash layers (or tephra) have been well-dated by international teams of researchers with remarkable precision and are a powerful dating tool for those studying Iceland’s first human centuries. 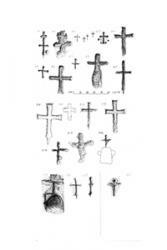 Illustrations of crosses A1-C19 (from Seljalandshellar) and KV (from Kverkarhellir). : Drawn by Ian G Scott (© Kristján Ahronson).Also interested in the way that people related to the wild environments that they encountered in early Iceland, with its coastal woodlands, Ahronson has developed new archaeological and palaeoecological methods to reveal the surface of dated volcanic ash layers as life-scale “photographic negatives” of the land surface when the ash fell, with holes preserved in the ash where trees or vegetation prevented its deposition. This palaeoecological work shows some of the impacts the early settlers had on their environments and helps us to better understand the processes by which people cleared and managed that woodland, and contributed to creating the pastoral the landscape (with its unstable soils) that we recognise today. Again, these human activities can be accurately dated and Ahronson’s discoveries chime with the other lines of investigation.